That looks like a good generator test unit or tini pickup if they were not so expensive or rusted out in the snow/rust belt.is it built with imbert air supply dementions. I ran it in my '94 Chev 1/2 T with the V6. It ran good but just to small of a hopper. I put a 55 gal drum on for a hopper and drove it to Argos. On the way home I was catching too much wind so I had to cut the hopper down 7 inches. At the same time I put the new hopper on I changed the air pre-heater to one that was about 15 ft of counter flow 3in pipe covered with 4in. That had to be cut down 7 in. also. I have taken that off. It weighed to much for the good that it did. Tom i looked again at that small hopper, is that a heated hopper unit.? Good morning Tom i gess the heated hopper did not add much performance gain or you would have used on your big hopper unit, correct? Hi Tom, you and I seem to have the same problem on the driving distance of our gasifier trucks. When I get behind the wheel to drive, I want to put down some miles before I stop again to take a break. 30 to 50 is just to short, give me more like 70 to 100, now I’m ready to pull over and refill the hopper with wood. But putting that much wind catching metal above the cab, causes to much drag for highway and toll turn pike and freeway speeds. Building it bigger in diameter and keeping the hopper low and still getting the wood chunks to flow with into the burn tube is the problem that I see. It gets really sticky with black tar when it cools down. This what I am dealing with. Looking forward to your solution to this. I think this is the realization of DOW for everyone. I hoping someone will come up with a solution. How about this? 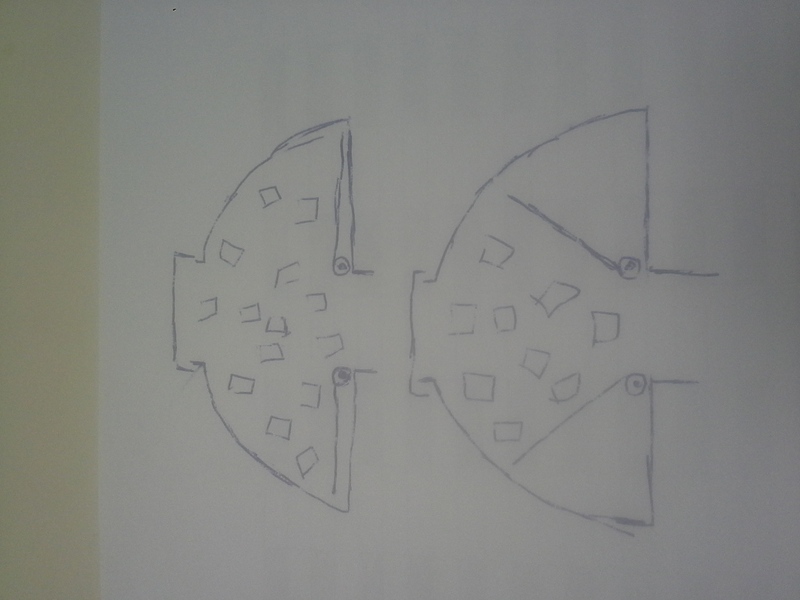 Excuse my rough sketch, it’s meant to represent an extension of the volume of a barrel, somewhat in the form of a monorator hopper. 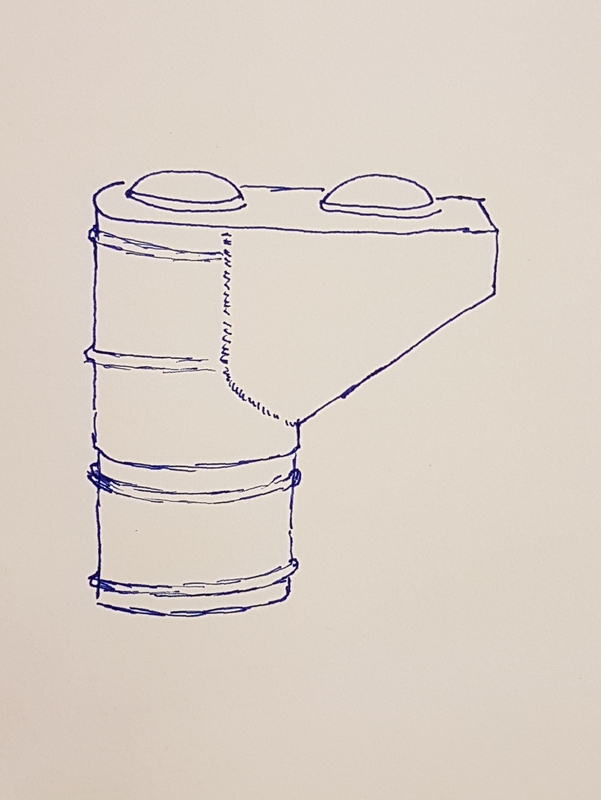 I sketched it with 2 filler lids, but maybe one set back a bit would allow decent filling with adequate access to the firetube? It would greatly increase fuel volume without greater height. I like it Wayne! Its similar in shape to what l had in my Chevys sistem. Garry, that’s funny! was working on hopper for the Ranger project today, and can up with same idea, because of having to keep everything low as possible. Wow Garry, I have the Same sketch in my note book, that is amazing. That’s good enough confirmation for me to build. Thanks Garry, Kristijan, and Al. That’s my next hopper design with gutter and monorator cooling tubes on the sides. Close. Puley or some other way mechanicaly operated. They must be released at refueling. But here is a risk, that wood-bits at the periphery might strangle (brake) the movement upward. The outer cylindrical surface may need a cylindrical cover-plate moving up with the flap, and avoiding the wood-bits to have ANY contact with the “silo”-wall. Also, if both flaps are allowed to start bending upward all together, they can lock each another, by compressing the wood lots against each another! This will be avoided, if only one at a time is allowed to rise up to ~60 degrees – what the moving “periphery plates” allow until reaching the center-line. This 60 degree position could automatically release the other one to start pushing upwards. Lowd, Lowd!!! The Chevy runs again!!! It was a battle getting running again because I didn’t remember what all the gizmos and thing-a-ma- bobs were suppose to do. Didn’t load the hopper up in case I had to take it apart again. I drove down the road a little over a mile and going, it was slightly down hill so I got into 5th gear; coming home I had to stay in 4 th. Previously either way I had to run in 3 rd.